Roses, chocolates, jewelry, and paper hearts — Valentine’s Day can be one of the absolute best holidays of the year. Niagara Falls and its natives are particularly fond of the holiday of love because the city and countryside are particularly conducive to ultimate romance. If you plan your next trip to Niagara Falls during Valentine’s Day, you’ll experience a true atmosphere of passion throughout the region. Some critics of Valentine’s Day dismiss the celebration of romantic love as nothing more than a retail holiday, Valentine’s Day has its roots in real events that occurred centuries ago. Though the Catholic Church recognizes three different martyred men under the moniker “St. Valentine,” the most likely candidate was a priest in Rome during the 3rd century. The emperor at the time, Claudius II, believed that single men made better soldiers than husbands and fathers did because singletons were more likely to risk their lives to defend their empire; thus, the emperor outlawed marriage for men under a certain age. In defiance of the law, Valentinus continued to perform marriages until he was put to death for his actions. A competing legend holds that St. Valentine is remembered for aiding imprisoned Christians despite his unquenchable love for their jailer’s daughter, to whom he often sent love notes signed “From Your Valentine,” a phrase mimicked by lovers today. Even though Valentine is a slippery historical figure, historians know that Romans celebrated love in February during their festival of Lupercalia. While the carnival required many sacred rites and rituals, one of the most exciting came at the end, when single men blindly chose women’s names out of a giant urn, and resulting pairs would spend the rest of the year courting one another. These ancient origins echo in the deep romance sought by impassioned lovers even today. 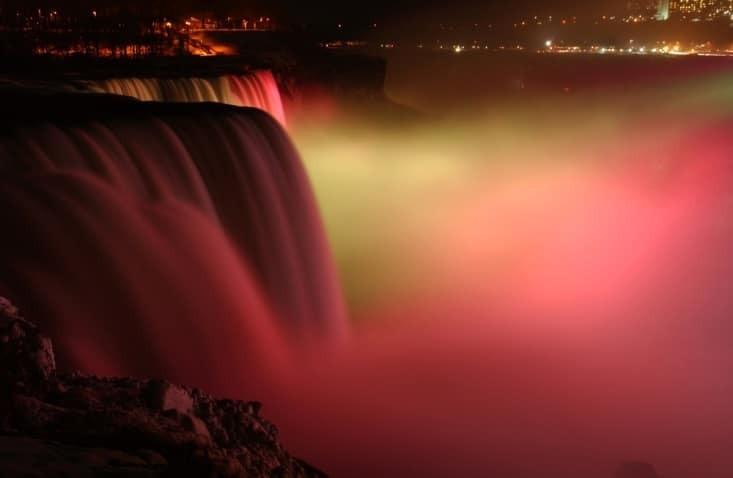 Fortunately, Niagara Falls can provide everything from the ambiance to activities for travelers on Valentine’s Day. A dreamy place to visit any time of year, Niagara Falls is especially conducive to love during the weeks surrounding February 14. Here are some of our favorite romantic activities for couples traveling on Valentine’s Day. Carriage ride. Just like a prince and princess in a fairy tale, lovers can cozy up in the back of a horse-drawn carriage in Niagara-on-the-Lake as it clip-clops down cobbled streets and through fantastic parks and gardens. Spa day. Christienne Fallsview Spa has some of the most relaxing and rejuvenating treatments to restore romance in any couple. Lovers can ask about partnered massages, facials, and other services, but a must is the infinity tub, which overlooks the thundering Horseshoe Falls. Winery Tour. Wine is the beverage of love — writers throughout history have said it — and there is no better location in North America for wine than the Niagara region. Partners can sample some of the New World’s best wines as well as dine on fresh and delicious meals made from local ingredients.